Soul Eater | I heard you liked music in anime and video games! 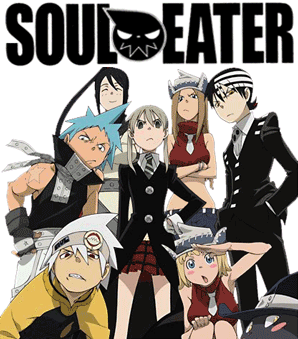 Soul Eater, a dark fantasy anime, has spectacular music influenced by punk, pop, and rock styles. This anime focuses on seven students at the Death Weapon Meister Academy. Here the students are divided into teams of shape-shifting weapons and their “Meister,” or wielder, and are sent on missions to collect souls that have turned into evil “Kishin Eggs.” The background music in Soul Eater is also influenced by the theme of “Order against Madness” which is a major focus in the series. The most memorable songs in Soul Eater are its two openings, “Resonance” by T.M.Revolution, and “PAPERMOON” by Tommy heavenly6. Both songs have strong influences in rock, with undercurrents of pop. Clockwise from center: Maka, Liz, Death the Kid, Blair (the cat), Patty, Soul, Black Star, and Tsubaki. T.M.Revolution, the stage name of Takanori Nishikawa, is a famous musician and actor who has had many of his songs reach near the top of the Oricon charts in Japan. Over his ongoing career, Nishikawa was a member of many bands, including his own named “abington boys school.” His music has appeared in several different anime including Gundam SEED, Gundam SEED Destiny, and Soul Eater. As his influence grew, a character in Gundam SEED Destiny was based off of Nishikawa in his early days as a musician. He was also asked to voice said character, a great opportunity for recognition. T.M.Revolution is now signed to Tofu Records, a record label that promotes j-pop artists in the North Americas. He has attended three major conventions in the United States; Otakon, Pacific Media Expo, and the New York Comic Con. Tommy heavenly6 is one of the two musical alter egos of Tomoko Kawase. Focusing more on alternative and punk styles than her other alter ego, Tommy february6, Tommy heavenly6 stemmed from repressed aspects of her personality. Her songs “PAPERMOON” and “Monochrome Rainbow” have been featured in different anime, as the second opening in Soul Eater, and the second ending of Bakuman respectively. Tomoko, as both february6 and heavenly6, has gone on several tours in Japan, but none in the Americas. I love Soul Eater!!!! Blacka Star. Yahoo!